In an effort to better include the Colorado College community in discussions regarding the endowment, top officials in charge of the $532 million investment fund fielded questions on Tuesday. 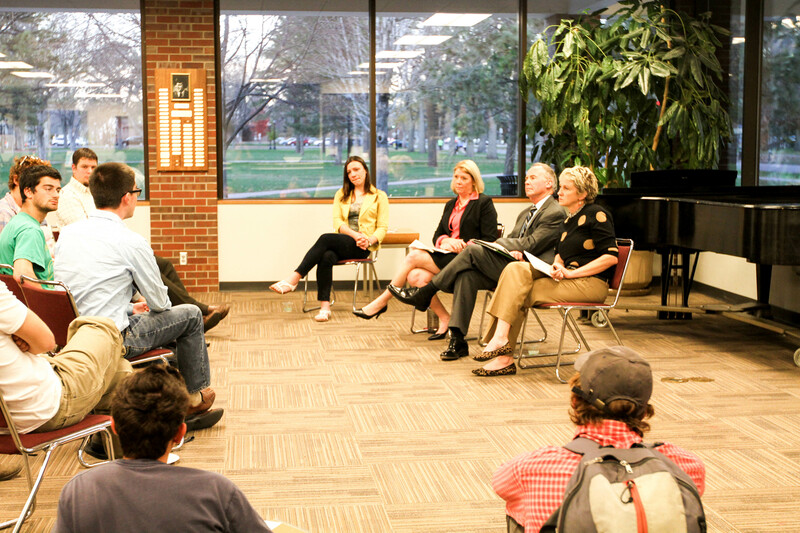 At the event, attended by roughly 50 people and hosted by President Jill Tiefenthaler, Vice President of Finance and Administration and Treasurer Robert Moore, Controller Stacy Lutz Davidson and Student Trustee Samantha Barlow, the discussion quickly turned to a virtually singular focus: sustainability. By the first few questions, it became clear that most of the students had come to talk about a cause in which they have been involved, and that the Administration and Board of Trustees has heard about, before. Students questioned CC’s decision to invest its Endowment in companies and industries based in fossil fuels as well as companies and corporations called “socially unsustainable” by some. The panel reiterated earlier statements explaining how trying to match endowment investments with the college’s “core values” provides a difficult task as values among students are not always shared or constant. The Endowment, the CC officials explained, is a specific monetary holding of the College, part of which is invested in stocks to provide payoff each year. It is a “gift that keeps on giving,” and every institution of higher learning has one. Almost to a person, when students raised their hands to talk, they would ask a question about divesting the Endowment from the fossil fuel industry. Several students pointed out that sustainability is one of CC’s core values. Others cited progress in other schools towards investment. This year in particular, a divestiture movement among college students has picked up steam. Students from a number of schools including Bowdoin, Middlebury, Harvard and Hamilton have become increasingly vocal about not investing in unsustainable practices, said audience members. The most common answer from Tiefenthaler, Moore and Davidson is that the Board of Trustees’ duty is to maximize the return on invested money. It would be highly impractical, they said, for the College to divorce itself from a company or industry—more often than not a lucrative one—because it engages in unsustainable practices. The economics professor in Tiefenthaler came out during the meeting as she asked questions of students when explaining the ideas behind investing the Endowment. Her most invoked answer to the divestiture question was that the Board needed to provide to the College inter-generational funding. That is, the Trustees have to not only think about funding CC for the next year or next 10 years, but for the next 50 and 100. Barlow, a member of the Board, echoed this. The assembled officials remained cautious of representing what the Trustees thought or did not think, would or would not do. “Ultimately, it’s up to them,” said Tiefenthaler. Instead, the Board hires firms to manage part of the endowment. Currently, the College employs almost 40 managers, overseen by Davidson. Barlow, the trustee meant to represent student voices, remained silent during the discussion of the Board’s thoughts and goals. In addition to sitting on the en banc Board, she is a member of the Board’s Finance Committee. The core problem, Tiefenthaler seemed to think, was two-fold. First, the College cannot cherry-pick stocks. Its clout compared to many other investors is not sizeable in the eyes of most managers, so it as little leverage to demand that a firm drop or not invest in certain companies or enterprises. Second, if the Board did decide to move the College toward sustainable investing, they would want to see equal or greater returns than what could be achieved with the inclusion of fossil fuels in their portfolio. Barlow and the others pointed out that interest in sustainable investing had waxed and waned for years, never managing to stir up a permanent following. For such changes to be viable, she said, there would have to be more than a “small but vocal group of students” trying to bring it about. She closed by urging students to fill out online surveys and to leave comments on her student trustee website expressing their views. A survey about student perception of the endowment is available on CCSGA’s website. 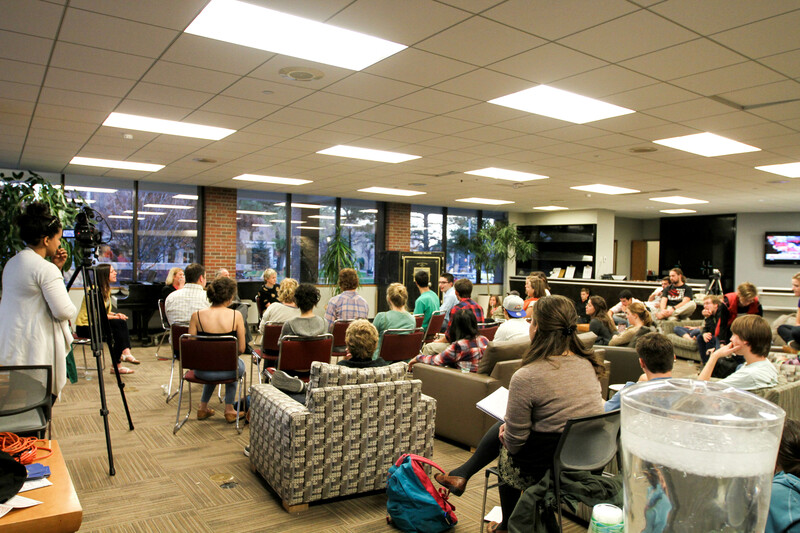 The Catalyst always encourages students to submit their opinions to the Comment and Debate section.